Today there is little evidence of the former factories of the Ribbon Company and Janes & Green portable buildings works in Guildford Road. Do any photographs exist of these two factories? Or advertising material? Did Janes & Green issue catalogues of shed designs? The firm of Janes & Green was launched in 1922, by Henry E Green of Castle Road, and his father-in-law Robert Janes, who lived at 8 Guildford Road. In its time 10 of the twelve family members worked for the firm. The Herts Advertiser in 1963 named three other kinds of portable buildings than sheds, garages and greenhouses which were the family's staple: a hospital wing, an auctioneer's office, and an art studio. Do you have any recollections of the Fyffes Banana Store at Smallford? This warehouse has been identified as a building, now demolished, behind the Homebase store. It was the same building as used for emergency meat warehousing during the Second World War. From the 1950s it was used for ripening bananas before they were dispatched to shops. A photograph of the building at the point of demolition is on the Butterwick Wood page. A rectangular tank was on Fleetville Rec during the Second World War, and was the subject of a question in Parliament regarding its close proximity to the underground shelters. Where were other tanks located? Three other tanks are so far known: a circular tanks near the junction of Jennings Road/Blenheim Road; close to the Ashley Hall near the junction of Hatfield Road/Ashley Road; and at the junction Cambridge Road/College Road. It is not confirmed whether these last two were circular or rectangular. There is also believed to have been a circular tank on a spare plot at the junction of Oakwood Drive/Elm Drive. We are searching for photographs of the impressive frontage of the former W O Peake factory opposite Clarence Park in Hatfield Road. Especially one which shows off the floodlighting of the frontage during the 1950s. Two rather inferior photos of Peake's factory have been identified, though do not show off the frontage at its best. A higher quality panorama, and if possible a floodlight image is still sought. A private school of that name was in Elm Drive from 1933 until c1960. What is known of the school? Mary, who lived in Elm Drive as a child, has been in touch to say she was a pupil from 1948 to 1954, and there were approximately 10 to 12 pupils. The uniform was grey and orange. Miss E M Kell was the teacher, in a bungalow with a timber conservatory at the rear "which leaked in wet weather." The only heating was a paraffin stove and in winter the children often kept their coats on. Nevertheless, Mary enjoyed her time at the school. Would former members of the 9th SA Scout Group Sandpit Lane, would be able to confirm whether its first hut at the junction Sandpit Lane/Lemsford Road was a nissen hut or a wooden hut, and what it had previously been used for prior to 1947. A former scout leader has been in touch to say the original hut on the site was, indeed, a metal nissen hut first used on the site in 1948. The Group moved there from Culver Road church hall in that year. The brick hut was completed in 1954. The 9th Group was started by Rev Cyril Isherwood in 1924. It is therefore possible that the nissen hut's original function was a Home Guard training centre during the war, but this needs confirmation. A former pupil of Beaumont School recalls that "from the age of 12 I worked across the Hatfield Road at Jescott Nurseries until I left [school] tending the dahlias in field and greenhouse." This would be the period 1956 to 1959. Do you have any recollection of this nursery in Hatfield Road, or maybe had some connection with it, knew the owner or purchased plants there? The premises were at 388 Hatfield Road; the Owner was Mr Ernest C Cooper (Ernie). Ernie had a smallholding behind the house, where Longacres playing field is today. He also grew dahlias on Roger Aylett's new nursery in the 1950s. He was an expert hybridiser. Gardeners familiar with dahlias will recognise the Jescott range, named after Ernie's wife. Do you know which organisation, committee or group runs the Hertfordshire Best Kept Village competition? 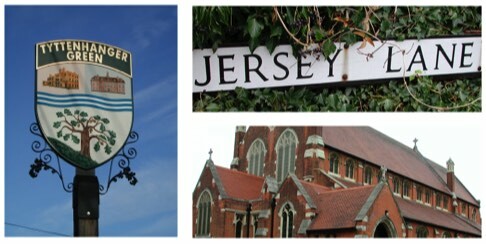 The competition has changed its name to Hertfordshire Village of the Year. It is run by the Campaign to Protect Rural England (CPRE) in conjunction with Hertfordshire County Council, and is sponsored by Hertfordshire Community Foundation. The Cafe has been dispensing refreshment from the time the parade, Bycullah Terrace, was built. A large rectangular public clock used to announce the name of the premises, Fleetville Cafe, and give the time – erratically – to passers by. Do you know when the clock was first installed and when it was finally removed? A photograph has turned up, showing the cafe in 1964 with clock! The definition is sufficiently good to crop a close-up of the time-piece at just before 3pm. It was known for being correct just twice each day! Although never specifically added as a question, the author has been searching for photographs or programmes of these tattoos, presented by the St Albans Scout groups, the later ones in conjunction with Bricks Crystal Palace Fireworks, whose factory was near Redbourn. Recently, a copy of a Tattoo programme has been shown to the author at the impressive archive and museum of Hertfordshire Scouts, for which permission to reproduce has been given. This programme, in excellent condition, dates from 1935. This is a question about the street name Swans Close and how it came to be called that. After Benjamin Swan retired from the motor business, Marlborough Motors, he lived in a house he named Marlborough House in Colney Heath Lane. The present development of bungalows is on the site of this house and the road has been named after the land's former owner. There used to be a tea kiosk, a small brick building with a verandah, at Clarence Park. It was close to the cricket pavilion. It has long since been demolished. Many residents will recall buying drinks and ice creams there. Does anyone have a photograph which includes the kiosk? It is reported that the kiosk was run by a team of sisters from Upper Culver Road. Granny Rose Manners led the team, ably helped by Bess Bunn and Ada Salt. Would still like a photo though! The 1911 census lists people who were employed by the "Golf links, Hatfield Road." Where was this golf course? The golf links, sited opposite Selwyn Drive as an enticement to prospective purchasers of homes built along St Albans Road west and Ellenbrook Lane in the early years of the 20th century, did not last long. Nor did the house building, interrupted by the First World War. And many of the homes face the bulldozer as a result of development at de Havilland's. The golf course was immediately south of Home Covert Wood. An attempt to revitalise the original housing development and golf course failed. But the Selwyn and Poplar estates followed in the 1930s and after WW2. The land had previously been owned by Great Nast Hyde Estates. A resident who grew up in Fleetville recalls attending St John's Preparatory School in Beaumont Avenue. St John's Lodge, formerly Avenue House, has now been replaced by St John's Court. Directories make no reference to the school. Do you have a recollection of it, or knowledge of uniform, documents or photographs? From Beaumont Avenue the school moved to Jennings Road. It had been run by Miss Bessie Hitchcock, daughter of Mr & Mrs W Hitchcock, then of St John's Lodge, Beaumont Avenue. Miss Hitchcock's school was at 75 Jennings Road, on the north side. It first appeared in the 1936 street directory when the house was new. Incidentally, Mr Hitchcock brought the name with him from their previous home in Verulam Road, replacing the previous house name, Avenue House. The sub-post office and stores was located in Station Road, Smallford, next to Alban Way. It was part of a 1930s style semi-detached house. It is now closed. Early 20th century street directories indicate that Charles Simmons kept a post office business and shop in this road from at least as early as 1907. As there appear to be no properties of that age now, where might the post office have been? The directories consistently placed the post office and shop in Station Road, Smallford, but were incorrect. Charles Simmons and his wife, Ann, ran a post office and shop in what is, today, High Street, Colney Heath. It was almost opposite the Crooked Billet public house. Thanks to John for helping to solve that conundrum. Knowledge of installations along the roads leading to and from The Crown junction is still sought, but there is now evidence of former underground shelters under Clarence Park. Although no information has yet been supplied about the open space in front of The Crown, dry hot weather has identified the location of an underground shelter, or may be more than one, to the east of the drinking fountain along the Hatfield Road path in the park. A long rectangle formed by a line of stones, and square escape hatches have shown up in the parched grass. Possibly the shelter was primarily for employees of W O Peake Ltd, whose coat factory was nearby in Hatfield Road. St Peter's parish had a pest house – to accommodate those with contagious diseases – in Oaklands Lane. It was located near the entrance of the community sports area. When was this building demolished? Does a drawing or photograph of it exist? This building was put up for sale in 1884, which presumably was the year of its closure as a contagion hospital. The city's medical health officer ordered that all of the contents should be burned and the building fumigated before further use. We don't yet know when the pest house was actually torn down. At the time the road was an extension of Sandpit Lane, although today it is called Oaklands Lane. According to a 1907 advertisement the company was located in Hatfield Road; "the most remarkable business enterprise of modern times. The seeds are sold at the uniform price of 1d per packet." The advert tells us that "St Albans is known the world over as the distributing centre for these seeds." Does anyone know of this firm, how long it lasted, or its whereabouts in Hatfield Road? This was a business from Leytonstone but with a registered office in St Albans. It copies the Ryder practices and even copied parts of the Ryder seed catalogues. Ryder's Seeds took the upstart to court and a restraint of trade order was placed on XL-ALL. All that remains is to discover what number Hatfield Road was its registered address. From the 1930s to the 1950s was Fred's Cafe, later becoming Sam's Cafe, on the south side of the main road at Smallford. Where was it in relation to today's buildings? Colin emailed to let me know that the cafe was on the garden centre (north side) of the main road and not on the south side as I had suggested. Which means that not all of the buildings on that side were demolished. We already know that the Four Horseshoes, also on the north side, survived into the 1960s. The Royston Club is not, as we might expect, in Royston Road, but in nearby College Road. But why? The club is understood to have been formed just after WW2 and had a peak of 400 members. Do any former members or officers of the club have recollections or additional information? Joan has emailed to say she believes the Royston Club is so called because it originally opened in a house in Royston Road, and then moved to larger premises in College Road, where there were still space building plots. It was a favourite watering hole for Joan's father after a Sunday morning's work on the allotment. Sydney lived in Castle Road, and in 1931 featured in the Herts Advertiser as a talented 11 year-old pianist. Does anyone know whether he took his musical careers any further? The St Albans Gang Show 1939 programme lists "Mr Sydney Barlow for good work and much time devoted to musical accompaniment, both for the rehearsals and at all performances." So, Mr Barlow was still in St Albans, physically and musically at least until then. Hobbs Close is a short road off Colney Heath Lane, and along with Swan Close this naming question has been partly answered. Alfred Hobbs owned a house in Colney Heath Lane, and also ran the firm of Tractor Shafts in Lyon Way. Thanks to Colin we have this information. The plot of land he owned in Colney Heath Lane included sufficient land to build the houses on the north side of Hobbs Close, between the ends of the gardens in Colney Heath Lane and the former railway, now Alban Way. The plot was formerly the field known as Cow Leys on the tithe map. When a row of cottages on Camp Hill was demolished in the 1950s, some of the land was used as a Salvation Army Sunday School and a small printing works. It has also been suggested that part of the site may have been a Territorial Army (TA) headquarters. Do you have a recollection of when it might have moved here from Harpenden Road, and how long the TA remained at Camp Hill? The local authority map dated 1965 does not show the building, which was in front of the former bakery. It had disappeared by the time the Baker's Close apartments were erected, for they are partly constructed on its footprint. So far, the timeline is unclear. 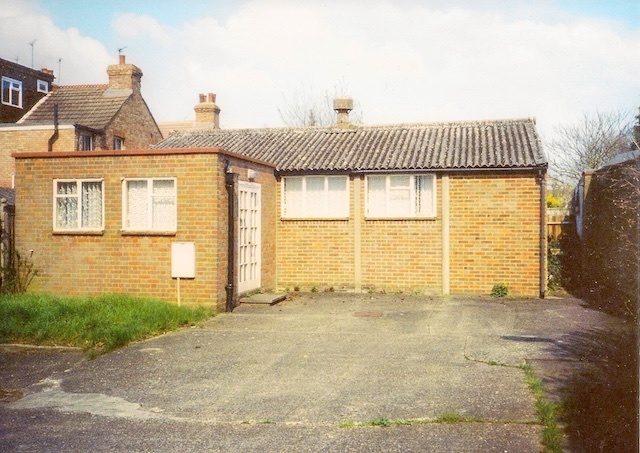 If you were a member of the Plymouth Brethren group who built a meeting room between Harlesden Road and Fleetville Rec c1960, the author would very much like you to get in touch, especially if you have a photograph of the building. A member of the Plymouth Brethren has been in touch. The group initially had premises in Granville Road, and during the course of the Second World War acquired a temporary building, erected at the corner of Hedley Road and Maxwell Road. It finally acquired the Hatfield Road plot and built its meeting room c1953/4. History shapes the present and informs the future.